Boardwalk Empire has a lot to answer for; the gangster movie seemed to have died in 2009 with Johnny Depp’s misstep Public Enemies. Martin Scorsese makes an admittedly brilliant TV show about prohibition era Atlantic City, and suddenly the gangster movie is back in style. Lawless is due to screen at Cannes next week, and tells the story of a group of brothers driven to desperate measures when the authorities try to take a cut of their profits. This movie is directed by John Hillcoat – the man behind the wonderfully dark and gory The Proposition – and should not be confused with the Lawless starring Ryan Gosling and directed by Terrence Malick. Lawless stars Gary Oldman, Tom Hardy, Shia LaBoeuf and the woman who doesn’t seem to have had a day off since Cannes last year, Jessica Chastain. Shia doesn’t instill confidence, but maybe we should just forget about Transformers and give the guy another chance!? lawless is due for release in August. We have seen many pictures of Ryan Gosling in his 20s gear over the last few months, but have had to wait until now for a trailer for Gangster Squad. The good news is that the movie – which focuses on a group of LA police officers who try to keep East Coast mobsters out of their city – looks fantastic. 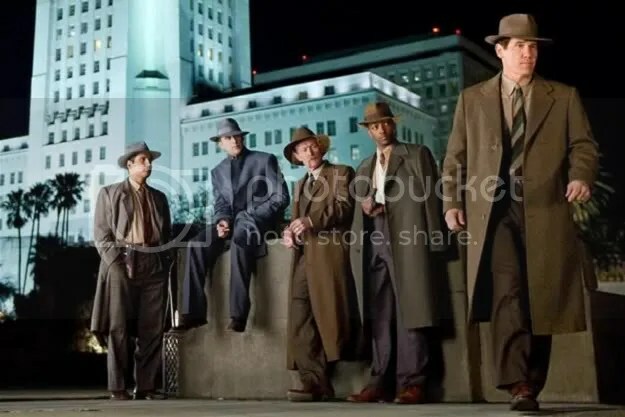 Tommy guns and loose morals are at play in Gangster Squad and everyone appears to have their own agenda. Whose will win out? We will have to wait until later this year to find out. Zombieland director Ruben Fleischer is at the helm for this one, a fact that instills some cautious excitement about the film… Even though the title sounds like a play on Police Squad, the hilariously brilliant TV show. Gangster Squad stars Sean Penn, Emma Stone, Ryan Gosling and Josh Brolin and is due for release in November. Dark Horse stars Selma Blair, Jordan Gebler, Christopher Walken and Mia Farrow and is due for release in June.